"Asian inspired soup that is easy and delicious. It's a meal on it's own and perfect for chilly days. My husband, who doesn't like Chinese food, loves this spicy soup at the start of a dinner. Leftovers freeze well." Combine the shrimp stock, lemon zest and lime zest in a large pot and bring to a boil. Reduce heat to medium and simmer for about 5 minutes. Add mushrooms and shrimp and cook until shrimp have heated through, about 5 minutes. Stir in the fish sauce, lime juice, green onion, cilantro and chile pepper. Taste and adjust salt and pepper if needed. Soup should be sour, salty, spicy and hot. Just what I needed to use up some limes. Easy preparation, quick and delicious meal. 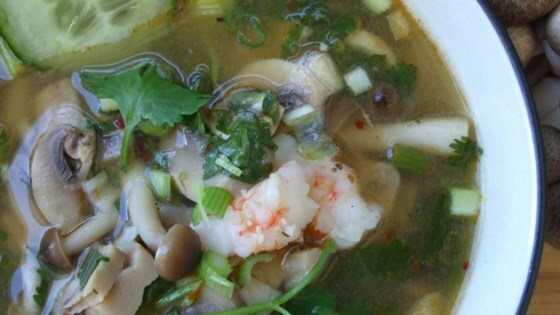 I used large shrimp--made the shrimp broth with the shells, then proceeded with the recipe. This soup was super hot and sour just as it claimed and I wouldn't change a thing except for maybe using some bean sprouts for garnish next time. Thanks for sharing!